Planning a frugal kitchen remodel? Here are 8 easy ways that we saved big on our own kitchen remodel! I still clearly remember the first time we visited our current house with the realtor for the first time. We were immediately drawn to the beautiful character we saw in it and we loved the layout too. But when I walked into the kitchen, my heart immediately sank a bit. It was dark and dingy and in desperate need of a good face lift! I knew that we could easily remodel it, but that wasn’t what caused the heart sinking. What scared me was the fact that I knew that kitchen remodels typically are pretty expensive and I also knew that our finances were tight enough that it would make things tricky if we ended up trying to do a remodel. Long story short, my husband and I both loved this place and couldn’t ignore the feeling that it was the perfect house for us. We ended up putting an offer in on the house and made it low enough that we still would have some cushion in our budget to do a frugal kitchen remodel and turn it into a spot that I could love. And as you already know, our offer was accepted and we bought this place and got to work turning it into our home! We really wanted to create a kitchen that was bright and cheery while also being an efficient work space…and of course all done on a fairly tight budget. It was a lot of work and I learned so much in the process, but I’m happy to say that our budget kitchen remodel turned out well and we ended up with a kitchen that overall works well for us! 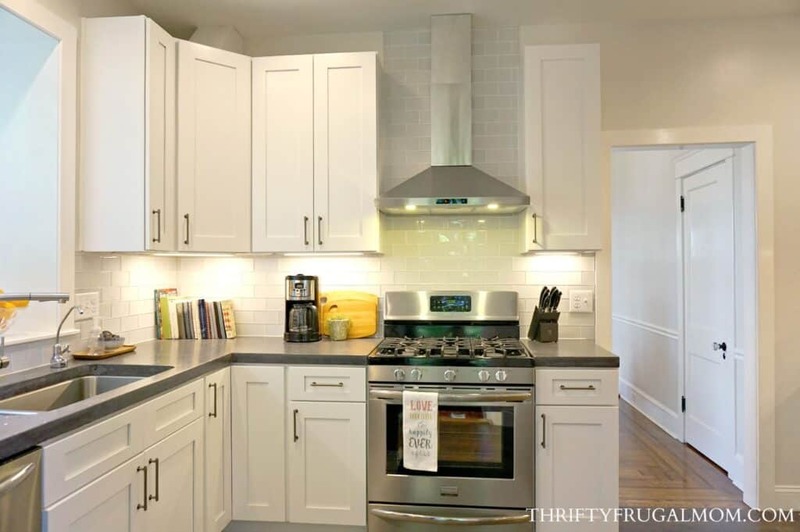 There were some specific things that we did though that saved us significantly and I want to share them with you all to hopefully give you some ideas of ways to save on remodeling a kitchen if you ever have the opportunity! There’s no doubt about it, sticking with our kitchen’s original layout saved us a lot of money! We had toyed with the idea of changing it up a bit, but it would have required possibly moving walls, changing plumbing, moving doorways and more- all of which would have added considerably to our cost. And really, in our case, I’m not sure all that work would have gained us much anyway. At least not unless we had upped our budget by 20,000 and totally moved our exterior wall! My husband and I both would have loved to have a slide in range just because they give a much cleaner look. But to save money, we bought our appliances as a package deal during a Black Friday sale and that of course meant that we had to be okay with the style of appliances that were in the package. The stove that was included in our appliance package was this freestanding gas range that of course has a “back” to it. It doesn’t give the clean look we love, but it is still a nice looking stove and the savings made it worth it! The appliance package that I mentioned above included an over the range microwave. The thing is, we didn’t want an over the range microwave for a number of reasons, so we had a dilemma. At first, we thought that we’d try to sell the microwave and then use that money to buy another one, but then we came up with a better solution. My husband just tweaked things a little to attach the over the range microwave to the underside of one of our kitchen cabinets. We ended up loving it and it saved us from needing to buy the microwave cabinet that we would have needed otherwise to put a regular microwave on! Plus, I think it looks so much cleaner without having a shelf for the microwave…and it’s one less thing to always try to keep wiped up! Because of the layout of our kitchen, one of the things that I was really set on having was a wall range stove exhaust hood, not an under-mount style. But it didn’t take me long to discover how pricey they could be! Thankfully, I discovered this one on Amazon that was just what I was looking for and a good $150 less than anywhere else. The price tag of custom cabinets was enough to make us quickly decide that ready to assemble cabinets were the way to go! And even though there are things that would have been super nice about using custom cabinets, going with Ready to Assemble cabinets from TheRTAStore.com ended up working out really well for us. 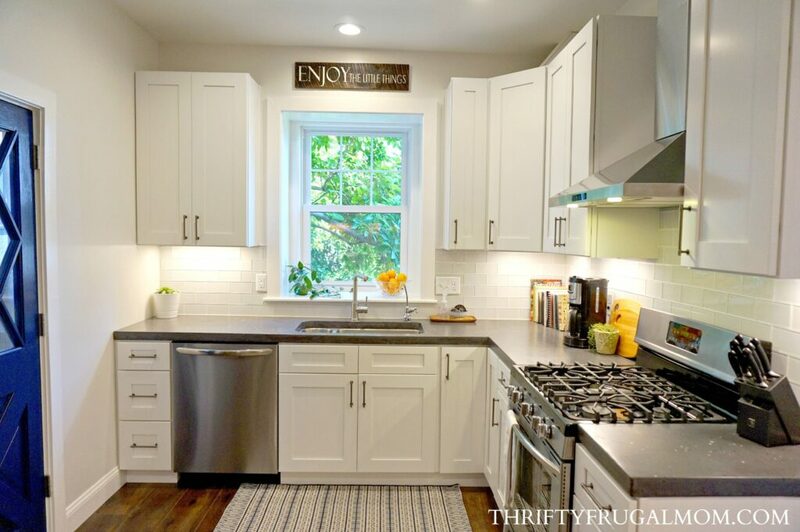 We’re happy with the look of our white shaker cabinets and are even happier about the money that we saved by going with them. Instead of buying drawer dividers/organizers through TheRTAStore.com when we bought our cabinets or buying dividers elsewhere, my husband just used some scrap wood to DIY dividers. I love it because we were able to customize them to make them work for our needs and also, the one drawer is really narrow and finding dividers that fit in it would have been super difficult anyway! Subway tile is one of the absolute cheapest tiles options available. We chose it not only because it’s inexpensive, but also because we love the clean, classic look that it gives. We did “splurge” a little though and instead of going with regular subway tile, we went with glass subway tile that we got at Floor and Decor. It added additional interest to our kitchen, while still being inexpensive. 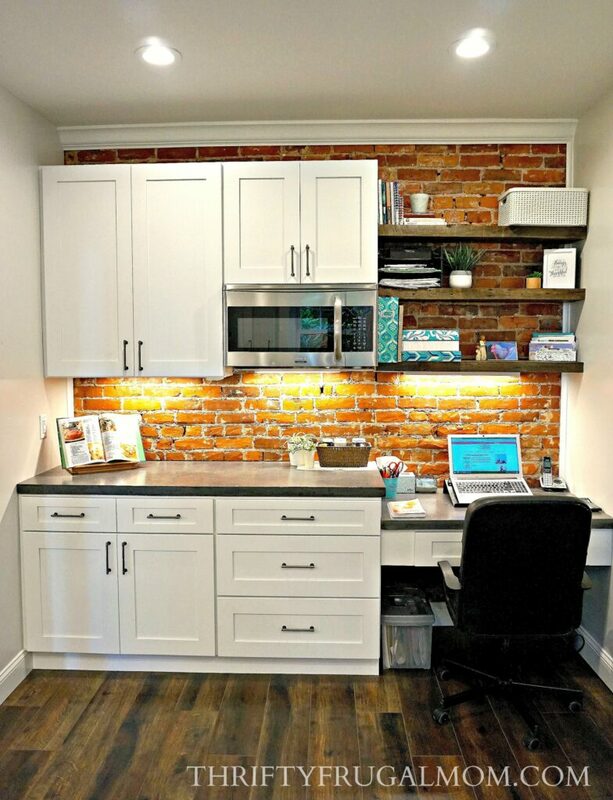 We weren’t originally planning to do this, but one day when my husband was exposing brick walls in other parts of our house, he got the idea to expose brick in our kitchen too. So how much did doing these easy things save us on our kitchen remodel? We saved at least a whopping $3,710! And to be honest, it was likely quite a bit more since I was very conservative in my estimations. Either way, we were happy to be able to get a kitchen that we love while at the same time still have that money in our bank account to use on other things that we needed. I’D LOVE TO HEAR FROM YOU! WHAT THINGS DID YOU DO TO SAVE ON YOUR KITCHEN REMODEL? Very pretty! We sanded and painted our old cabinets white and spray-painted the old handles antique bronze/brown. I would like to paint the old formica countertops some day. Hubby moved a wall and enlarged the connecting laundry utility room to also be a food pantry. We added new light fixtures. The only costs were for paint, mud, a little wood, and the light fixtures, and a whole lot of sweat! 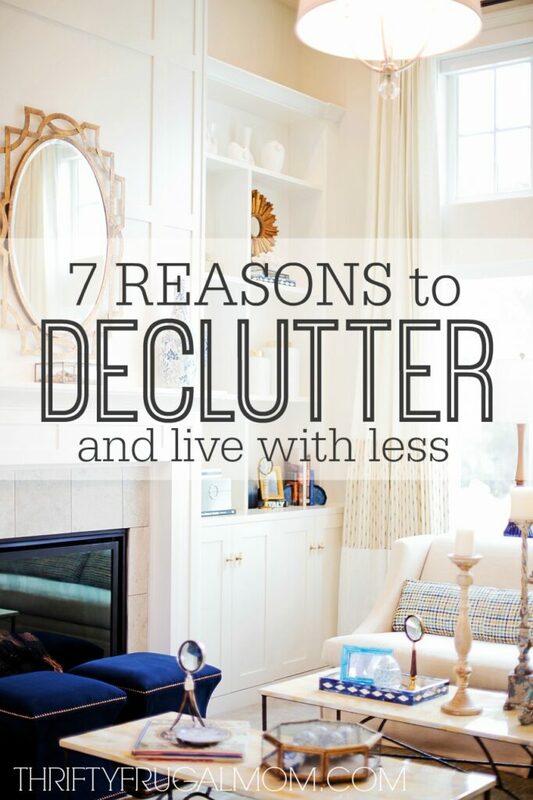 But very frugal diy-ing for us. We had 5 kids at the time, so very little money to spare. If you want to save money for your kitchen remodeling then it is important you should make a budget plan. You have to select the best material but according to your budget. It is better if you make a plan based on your neighborhood's kitchen remodeling cost. Apart from the best material cabinet and appliances are also plays an important role to increase the design style of your kitchen but these are costly so it is better you should choose the cabinet that will low cost. Rather by doing yourself if you hire a professional contractor then you can save time and money. Good tips, Owen! And yes, budgeting is so important. We used our existing cabinets to save a lot of money. We changed the hardware out but left the cabinets. That's definitely a huge money saver! And a great option if your cabinets are in good enough shape to keep. I'm always looking for cheap ways to remodel! I love the ideas! I love your desk! Can't wait to buy a house and do some of these things. Thanks! I really do loving having it too! And I hope that you can realize your dream of buying a house soon. Just another idea for an even more inexpensive backsplash. . . I saw once a great idea for a backsplash that I hope to use someday. The kitchen I saw had a linoleum backsplash. These days you can get a great quality linoleum that looks like tile, or wood, or marble, or whatever you want. The backsplash is Cheap (especially if you find remnants, you know that strip someone had leftover and doesn't want!) and EASY TO WASH. The only important thing is to do something different around the stove where heat could be a problem, depending on the layout of the kitchen it would look funny to do something different at the stove, so of course frugal ideas have their limitations, but if the layout were right, this could be an enormous money saver. That is such a great, frugal idea, Doreen! I'd love to see what it looks like, but I can believe that with all the great quality linoleum available now, that it could totally be a nice looking option. It's to the left of the blue door in a bump out that was created specifically for it by previous owners. The bump out makes the front of the fridge flush with the wall that the blue door is on and allows our small kitchen to actually not feel quite as crowded. If you want to see more how things look, there are a few pictures in this post that show the fridge. What kind of counter tops did you use? We used concrete counter tops. They aren't always necessarily the cheapest option, but we had a friend that made them for us (we paid him) which made it a very reasonable option in our situation.